Yeah, hate this. 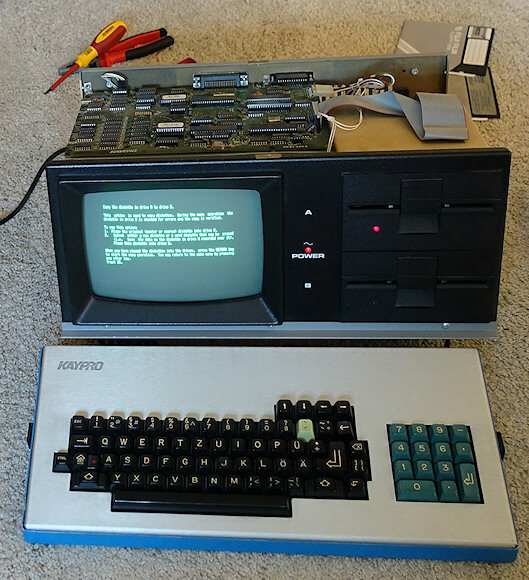 While I tried to copy Kaypro II floppy disks in my PCs (with TELEDISK first, but then with 22DISK, and with many read retries), I thought it would be much easier to copy them with my Kaypro II itself. Just power it on, boot with CP/M 2.2, start COPY, and then the copy session for about 10 disks was started. But guess what happened - it makes an ugly "Poff" sound and then it stinks forbidding. 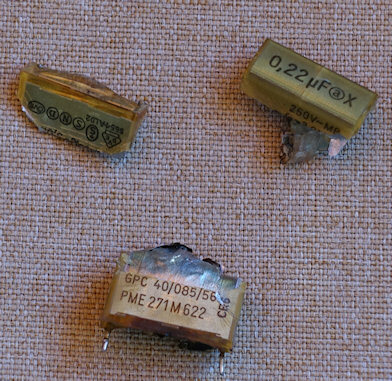 The capacitor for avoiding interferences from the power supply line, a 0.22 uF "film" one, exploded and burned a bit too. I switched immediately the computer off and carried it to outside the house (... still stinking). 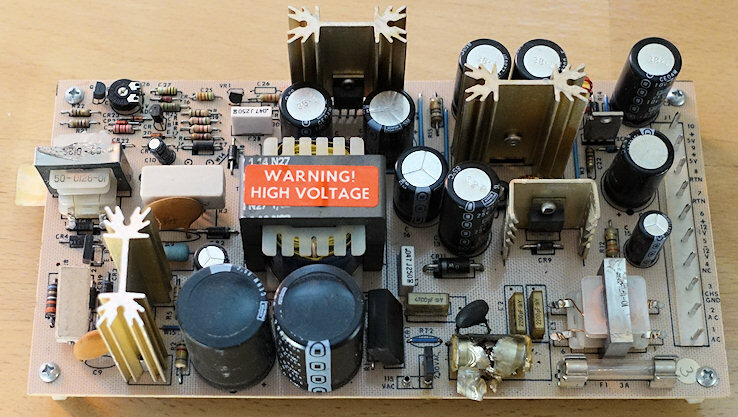 There were some other capacitor candidates for a later replacement, but I was happy it runs again.... the Kaypro II and its power supply was MUCH EASIER to repair compared to the nightmare with the Macintosh IIci. See "related link". But it was IBM's necessary answer to the Compaq Portable PC, a bit late, yes. And it's a beauty meanwhile. Other portables looked more ugly. It was selled from late 1984 until Sperry Corporation was merged with Burroughs in 1986. It doesn't have an amber screen (like the IBM Portable PC), instead, a green one with 9 inch size. An Intel 8088 with the same speed like the first IBM PC and 256KB RAM (expandable to 512KB on motherboard) was included. 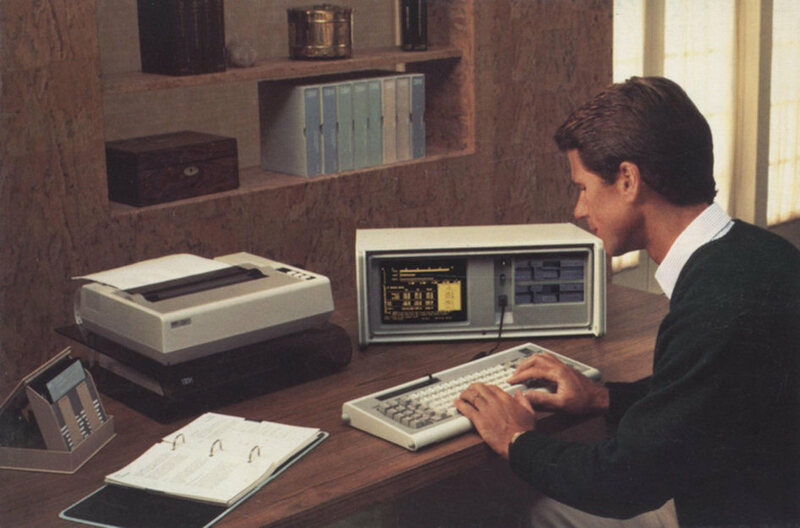 See also in related link for an article in "Infoworld", November 1984. Do you remember the times games only shows text messages ? 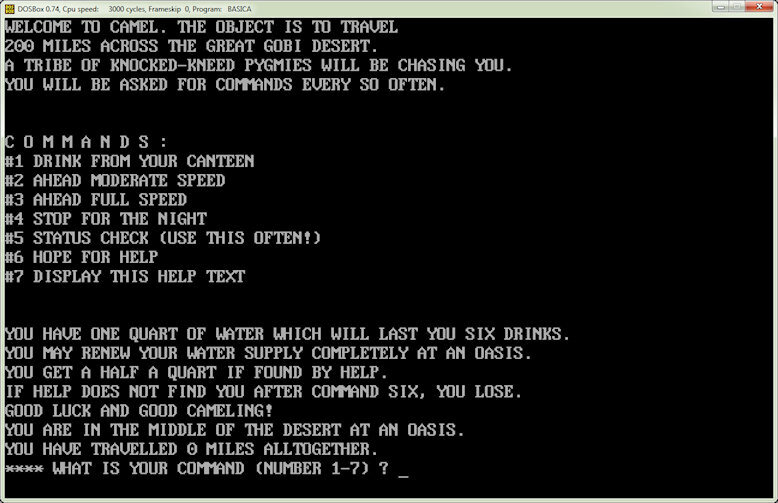 David H. Ahl was the editor of two real famous books: "BASIC COMPUTER GAMES" and "MORE BASIC COMPUTER GAMES" in 1979, published from "Workman publishing, New York". One of these games I remembered was "CAMEL". It just shows up a few text messages and you can enter a small range of numbers as a command what to do next (after the game started). 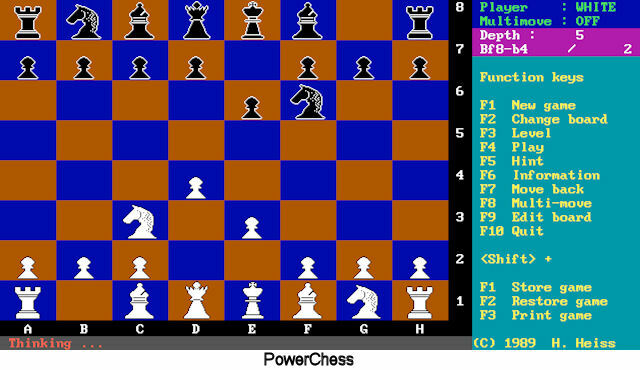 Of course the whole program flow was controlled by the random generator, you will NOT often win. But it was fun to beat the computer... at least if you would reach the 200 miles limit. The game source was slightly improved, e.g. displaying the status was decreasing life points (so I changed this, it will not decrease life points anymore and I added a help display). I didn't changed the original program logic, so it's still not easy ! You can get the BASIC SOURCE CODE if you click on "related link". Good luck while playing the game. If you're curious about the (compiled) DOS version, see "related link" below. Btw. 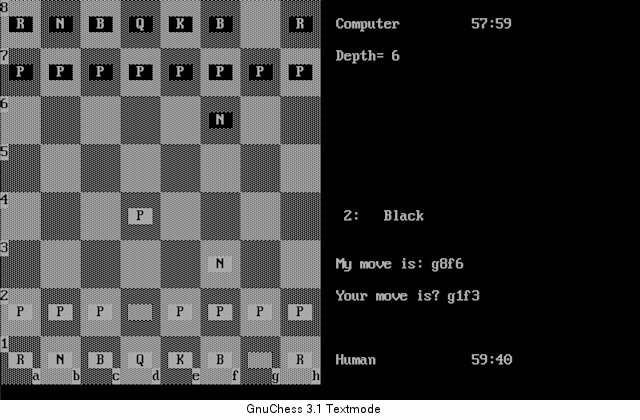 look at D2 or G1 - GnuChess 3.1 does not "repair" the traces of your movements (so it's programmed faulty in the display section). 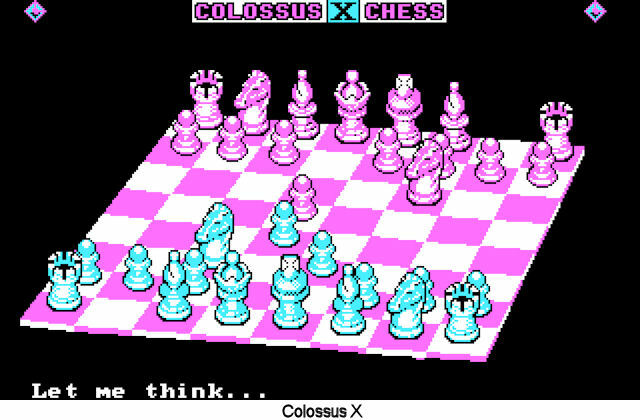 A really beautiful chess display is offered in 1990 by Colossus X.
Chessmaster 2100 can use EGA and looks in 1991 much better than every other chess game. 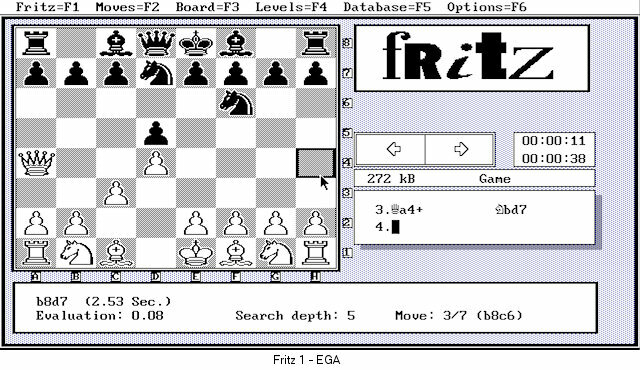 In the same year (1991), Fritz 1 was published, really a STRONG chess partner already ! 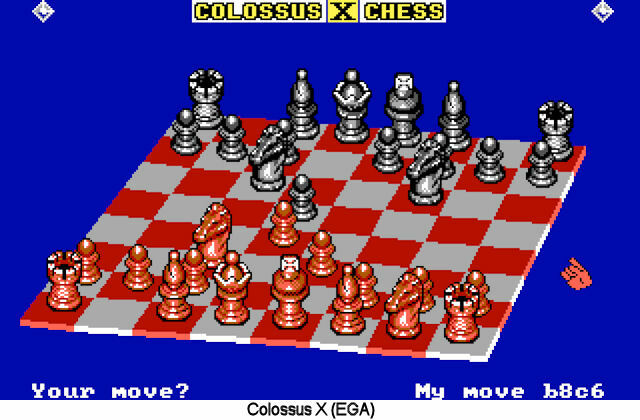 This shows the EGA display. 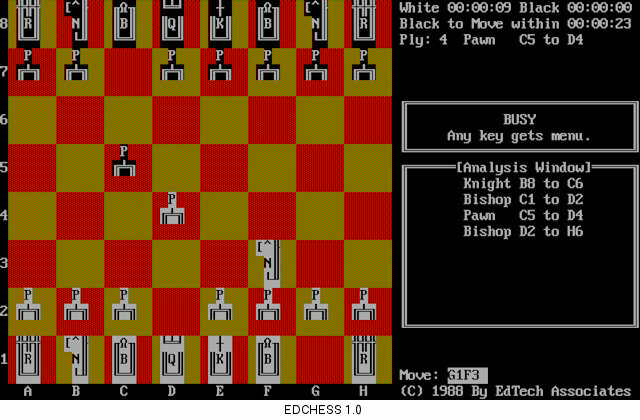 It runs surprisingly also in graphics mode on Hercules cards. 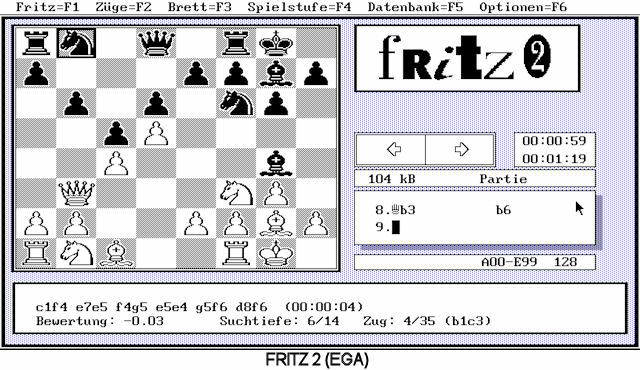 In the year 1993, Fritz 2 was published, now it has already reached an ELO number, I have to resign always ! 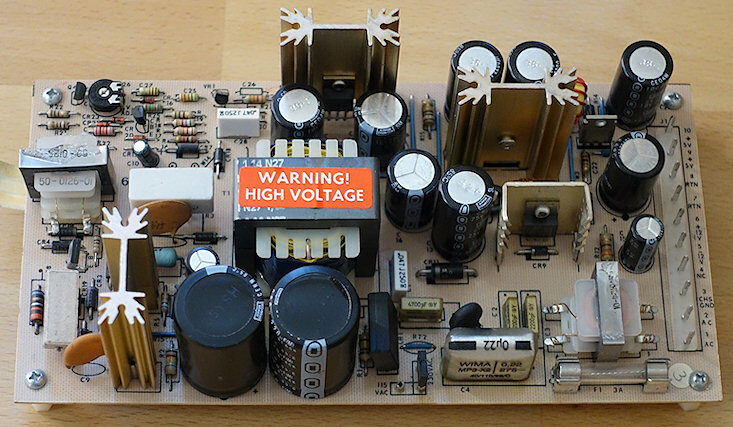 Can be used with a VGA display, like the predecessor too. It runs surprisingly in graphics mode on Hercules cards, too. 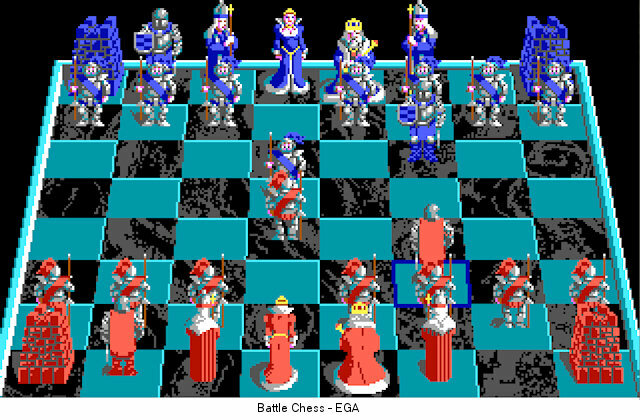 All following MS-DOS chess games which were published after 1993 can only be used with a VGA or SVGA card. 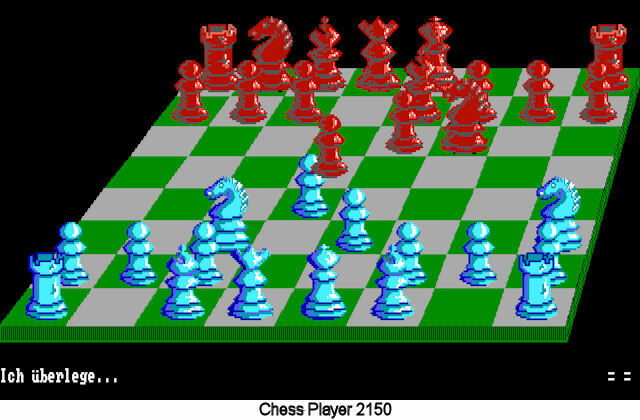 So if you own a vintage PC with just a CGA, Hercules or EGA card, don't look for newer chess software. 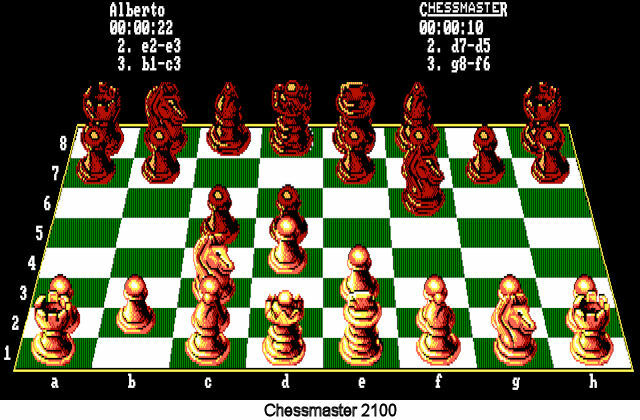 Many (higher) version follows, this one appeared in 1986. Here CGA display was used. 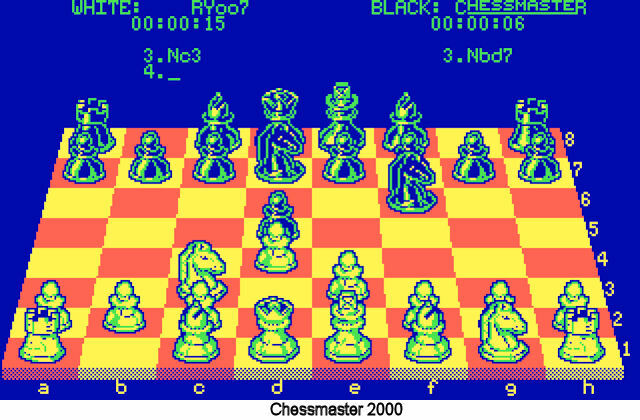 ChessMaster 2000 can be run also in graphics mode with Hercules cards (but looks ugly). This program is really SLOW. Just for completeness listed, not because it's good.